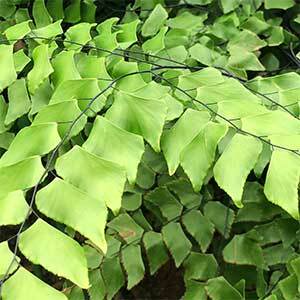 Native to the rainforest areas of South America Adiantum trapeziforme is one of the most spectacular of all of the maidenhair ferns. It comes from the tropical rainforests, so it likes moisture, warmth and filtered light.. The foliage is trapezoidal in shape, so two parallel sides and two not. You will need a warm sheltered position to grow this fern outdoors. It does not grow well in frost prone areas. The soil needs to be moist humus rich and well drained. Fertilise with a little liquid seaweed fertiliser in spring and again in mid summer. Pruning is limited to removing dead foliage at anytime of the year. In cooler climates you may need to prune harder at the end of winter to refresh the growth. A little mist spraying each week to increase humidity will be beneficial in summer. Propagation is by division of clumps or from spores. In all but warm tropical climates it is unlikely to naturally spread by spore dispersal. Evergreen – Yes depending on the climate, deciduous in cooler climates. Pot Culture – Suited to growing in both pots and hanging baskets.